Sibelius 6 in all its glory. Here you can see the new Keyboard and Fretboard windows, which offer alternative ways to interact with the notes on a score. It's now possible to display page spreads vertically, which is great for those with high‑resolution displays. The last time I looked at Sibelius 6 was about 15 years ago. Back in the days when the program ran on the sadly now defunct Acorn personal computers, its full title was Sibelius 7; and Sibelius 6 was a more affordable version aimed at those who didn't need the full feature set. So it's with a wry smile, and perhaps a sign of age, that I'm once again looking at a product called Sibelius 6. One of the most interesting new features in Sibelius 6 addresses a problem with which we're all probably familiar. How many times have you created successive versions of a score, appending filenames with sequences of characters such as v1, v2, v3, and so on? And then, how often do you forget what changes were made in different versions and end up editing the wrong score? If you're anything like me, I'm guessing the answer is: quite often. So to make it easier to handle revisions to scores, Sibelius 6 introduces a new feature called Versions. Simply put, this is a basic versioning system, allowing you to keep track of different versions of the same score within a single file. The Edit Versions window provides an easy way to manage different Versions of your score. 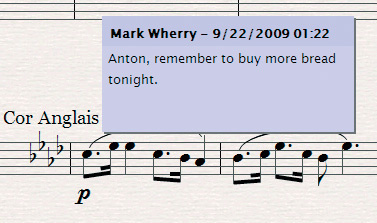 When you're working on a score, it's quite common to use the Save As command to create a new instance of the current score. This means that new edits can be tried out, and, if you don't like them, you can always return to the original version. In Sibelius 6, you're always working on what is known as the Current Version of a score. When you reach a place you might want to return to, instead of saving a new instance of the score, you can create a new Version instead, with the new Save Version command. If you close the score after a period of intensive editing without creating a new Version, Sibelius will automatically prompt you with the New Version window. This behaviour can be disabled, and you can also set various options for Comments when creating a New Version. It's possible to insist that a Comment is created for a Version, or you can disable the Comment field altogether. For me, the default option of an optional Comment is just fine. Once different Versions have been created, you can recall an earlier Version by using a pop‑up menu on the toolbar. Because only the Current Version can be edited, earlier Versions are read‑only, and are displayed, appropriately enough, with a crumpled paper background. However, selecting and copying are permitted, making it possible to bring data from a previous Version into the Current one. At this point, you might be wondering how saving Versions is any different to saving files. You can, after all, always load up older files to copy and paste from. But whereas copying and pasting is about all you can do when Versions are saved as different score files, this is just the beginning of what's possible when working with different Versions of the same score. The Edit Versions window provides an easy way to manage Versions. It shows a list of Versions in the currently loaded score, complete with start and end dates; and there's even a handy preview display so you can quickly browse the different Versions. If you want to revert to a previous Version, a Make Current button is provided. This automatically saves the Current Version, and creates a copy of the previous Version as the new Current Version, giving you full flexibility if you later change your mind. Very handy indeed. And as an added bonus, you can even save new score files of individual Versions, should you wish. This is especially useful if you want to give someone a score without letting them see your dirty laundry! As well as managing some other general housekeeping tasks, such as renaming Versions, the Edit Versions window also lets you browse through any comments added to Versions. A particularly useful feature, especially when you're collaborating with other people, is that you can add multiple Comments to the same Version. In this way, different contributors can make their own Comments against different Versions, and everything gets saved in the one score file. The Compare window makes it possible to compare two Versions of the score. 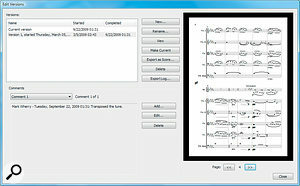 Here you can see a split‑screen view with two Versions of the score. The Current Version is on the right, and notice how Sibelius highlights the notes that have changed from the previous Version. In the spirit of saving the best until last, what makes Versions indispensable is the way Sibelius can track edits made to your score. The simplest example of this is an Export Log feature, accessible from the Edit Versions window. The log file is saved as an RTF (Rich Text Format) file, which can be read by most word processors — even Wordpad on Windows or Text Edit on the Mac will do. And it contains an astonishingly detailed report of the changes made between Versions of your score, complete with graphic representations highlighting these changes. Where an object has been added to a newer Version, the new objects are highlighted with a green background. Yellow indicates an object that has changed, such as a note that was transposed, and red is used to show objects that have been deleted in the later Version. This makes it really easy at a glance to see the nature of any changes between different Versions. When looking for differences between scores, Sibelius currently focuses mostly on musical content rather than layout details. So while the log will tell you that an expression marking was added, it won't tell you if you later adjust the position of the expression marking. This is perfectly acceptable, since the feature is obviously designed more as a compositional tool. But it might be interesting if an advanced layout mode could be added in a future version — although maybe this would be too much. While having a log file is handy, it's not particularly interactive, so Sibelius 6 also offers a new window enabling you to compare two Versions of the same score side‑by‑side. Sibelius will open the two Versions in two windows next to each other, with a third window reporting the 'Summary of Differences'. This offers descriptions such as "Changed notes in 2 bars”, which aren't particularly detailed, although the Compare window itself usually offers more precise entries like "Pitches transposed diatonically”. A very useful function with the entries in the Compare window is that you can double‑click them to jump to the place in the score they reference. A small complaint is that the entries in the Compare window aren't cleared when you close the score. And while there might be a reason for this, it's a bit confusing if you start a new score with the Compare window open and still see entries pertaining to the previous score you were working on. But that's just nitpicking. Overall, the Versions feature is the kind of elegant solution one would expect from Sibelius. It's well thought‑out and easy to use once you've taken a few moments to adjust your normal working approach. And while you don't have to make use of this feature, you'll probably be glad you did. Comments enable you to add virtual Post‑it notes to your scores. At the most basic level, a musical score is nothing more than a collection of symbols. And so, to help people understand a score, it's important to present this collection of symbols as clearly as possible on the page. Sibelius has always excelled in the quality of its output, and, for the most part, the ease with which a good result can be achieved. However, there are often times when you need to make changes that disrupt the layout of various symbols, such as dynamics, lyrics, and pedal markings, which then require some manual adjustment to resolve any overlapping ugliness. The very first version of Sibelius on Windows (version 1.3, to be precise) introduced a feature called Magnetic Slurs. This made it possible for slurs to be automatically reshaped, should any notes within the articulation be adjusted. And since the introduction of Magnetic Slurs, many other symbols in Sibelius have developed 'magnetic' behaviours: magnetic in that they're both attracted to relevant objects, and repelled by objects that have no strict relevance. Accidentals will stay attracted to the relevant notes, for example, whereas bar lines will be repelled by accidentals, ensuring that you don't get such objects drawn over a bar line. Magnetic Layout, enabled by default in Sibelius 6, brings such behaviour to the majority of score objects. First, it identifies certain symbols or groups of relevant symbols on a system, and then it monitors other objects on the score that might collide with these symbols or groups. When you move an object on the score, Sibelius will calculate whether the object you're moving will collide with one of the identified symbols or groups. If it does, the program will automatically move the symbol or group to avoid a collision. This is obviously both clever and convenient, and is actually much less complicated than it sounds. As you add symbols to your score and move them around, Sibelius will group related items together based on their positions. You'll know when this happens because Sibelius will display a blue dashed line between aligned symbols, and square brackets around the first and last symbol in the group. Examples of symbol groups would be dynamic markings, where you have expression text followed by a crescendo, or lyrics. Say you have a vocal line with lyrics, but you need to change the pitch of a note. The new pitch is below the staff and will obstruct the corresponding lyric, so you'll need to move all the lyric text on that system to make space for the transposed note. Moving only the affected lyric would, after all, look rather ugly. But with Magnetic Layout, the movement of the lyrics is handled for you. As you change the pitch of the note, Sibelius will automatically adjust the vertical position of the lyrics to avoid the collision on the affected system. This is incredibly useful, and I find myself unable to stop smiling every time I see Magnetic Layout at work. If Sibelius isn't able to resolve a collision, the objects involved in the collision will be coloured red. This makes them easy to spot, especially if a change in one part of the score causes a collision on a part of the score not currently visible. Commands are available that navigate to the previous or next collision in the score, and these will seem particularly appropriate the next time someone remarks that your score resembles a motorway accident. If you don't wish for a symbol to become part of a group, you can simply move it slightly out of range. Alternatively, individual objects can be flagged for collision avoidance, which sounds like a type of insurance, but forces an object to be ignored by Magnetic Layout. If you want to make sure certain classes of symbol are never used by Magnetic Layout, there's a rather sophisticated Magnetic Layout Options window where you can define the behaviour for over 50 object types. This is probably more than the average user will need, but publishers and other advanced users will undoubtedly welcome this level of control. To suggest that the new Magnetic Layout feature is helpful would be an understatement. 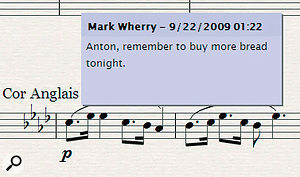 It's unbelievably helpful, and is one of those typical Sibelius features that you'll wonder how you ever lived without. Here you can see a very basic example of how Magnetic Layout works. The left bar shows the original score before any adjustments have been made, while in the middle you can see the same bar with Magnetic Layout enabled. The dynamic markings were moved automatically when the note pitch was changed to avoid a collision, and note how the original positions of the markings are shown in grey. The final bar on the right shows what the score looks like when the pitch of the note is changed with Magnetic Layout disabled. Although the changes to Sibelius' playback abilities in version 6 are conceptually simpler than the introduction of plug‑in support and SoundWorld in Sibelius 5, they are no less significant. Support for ReWire has been added, enabling Sibelius to be used with other ReWire‑compatible software, and the integrated Kontakt Player has been replaced by two new software instruments, developed by other companies in the Avid 'family'. This is an incredibly welcome change, as for all the built‑in convenience of Kontakt Player, it also resulted, on occasion, in a great deal of built‑in hassle. The first new instrument is General MIDI Module. As you might imagine, this is a simple instrument offering a library of General-MIDI‑compatible sounds, but its relatively unexciting name belies its rather intriguing heritage. In both appearance and content, it's closely based on the GM4 module from M‑Audio's Key Rig software instrument. This was developed for M‑Audio in 2004 by a company called Wizoo, which was later acquired by Avid in 2005 to become Digidesign's Advanced Instrument Research (AIR) group. But before the acquisition, Wizoo also developed many instruments that were distributed by Steinberg, including a virtual sound module called Hypersonic. If you dig around the folders where Sibelius is installed, you'll notice the content files are remarkably similar to those originally supplied with Hypersonic. But this pedigree is actually a good thing. While the technology and sounds are arguably a little dated, the advantage is that General MIDI Module is pretty efficient on modern computers. For example, the sounds require merely 200MB of disk space. Even if you have a particularly modest system, you'll easily get better playback mileage from this instrument when compared to Kontakt Player. One very minor issue I noticed with the new General MIDI Module concerned the Reverb and Chorus controls in the Mixer window. While changing these controls in the Mixer window updates the Reverb and Chorus controls in the General MIDI Module's own user interface, the reverse is not true. Adjustments you make in the module's own interface are reflected in the Mixer window, and both states are stored independently when the score is saved. It's not a big deal, but it could cause some confusion. For better‑quality playback, Sibelius 6 also includes the new Sibelius Player, with an improved Sibelius Sounds Essentials collection. Sibelius Player is apparently based on the latest technology from AIR, which presumably means it's derived from Structure, Digidesign's sampler plug‑in for Pro Tools. For one thing, the updated Sibelius Sounds Essentials instrument library is now supplied in Structure format. This means, rather splendidly, that you can also use these instruments in Pro Tools with a copy of Structure — and even the free version will do. There may be caveats to this, but the couple of instruments I tried loaded just fine. The new instruments and sounds in Sibelius 6 make a big difference. Scores created in earlier versions will, of course, sound a little different, but any inconvenience here is easily outweighed by the advantages. Sibelius Player seems laudably efficient, and the fact it has no user interface means that its presence is largely concealed from the user. A pleasant contrast when compared to Kontakt Player! I still find it occasionally frustrating that certain playback‑related operations only become active after you press play the first time, but that's a minor point. General MIDI Module is a basic sound module, offering an efficient way to play back scores on less powerful systems. If you've ever fancied yourself as Toscanini, Sibelius 6's new Live Tempo feature will be right up your podium. Live Tempo complements the many automatic methods Sibelius has for interpreting the performance of scores, allowing you to conduct the tempo of your score in real time. However, rather than using a baton — although it can only be a matter of time — Live Tempo lets you beat time by using either your computer's keyboard, a MIDI keyboard, or a MIDI foot pedal, such as a keyboard's sustain pedal. Before you use Live Tempo for the first time, it's a good idea to let Sibelius calibrate your conducting tool of choice. A Calibrate Live Tempo window enables Sibelius to determine the latency of your system as you tap along to a click played at 100bpm. Once calibrated, you're ready to record. A new Record Live Tempo button in the Transport window lets you start playback for Live Tempo Recording. Once enabled, Sibelius waits for you to conduct a full bar of your intended tempo before playback begins, although you can change this count‑in length if you wish. Conducting your score from the keyboard is a curious experience at first, especially when you realise that the program really is following your directions. As with the real art of conducting, it takes practice to hone your skills, but the process works surprisingly well. You can configure the sensitivity of Sibelius' response to your taps, and a particularly useful option is the ability for Sibelius to use what are called 'beat multiples'. This allows you to tap in double time (eight taps per bar in 4/4, for example), which is really useful for getting better results at slower tempos. After you've made a Live Tempo recording, you can listen to the results by playing the score back. An additional Live Tempo button in the Transport window toggles between Live Tempo playback and the normal Sibelius mode. If you display your score in Panorama view, you can even see a graph showing your Live Tempo data. And although you can't edit this data manually — which would be a nice touch — it is possible to delete certain bars of the recording. Simply select the bars you want to clear in your score, which will also become selected in the tempo graph, and use the Clear Live Tempo command. If no selection is made, all of the Live Tempo information will be cleared, although Sibelius, fortunately, warns you about this first. Live Tempo is yet another fabulous addition to Sibelius 6. It makes the playback of scores sound far more natural, but it's also useful for trying out different interpretation ideas while you're composing. Perhaps the icing on the cake would be if you could store more than one Live Tempo recording at a time, enabling you to try out multiple ideas and switch between them. But that's a wish rather than a criticism. As is customary for a new version of Sibelius, there are always more features and improvements to be excited about than those headlining the release. And Sibelius 6 is no exception. In fact, the list of "other improvements and fixes” covers 24 pages in the 'What's New?' guide supplied with the program. It's impossible to discuss everything that's changed, so I'll just cover a few that raised my eyebrows. One new feature I particularly like is the ability to view pages organised as a vertical list. Previously, Sibelius always displayed pages in a horizontal row, which made perfect sense from a real‑world perspective. But since most document‑based applications, such as Word, have the user scroll vertically through a document, it somehow feels more natural to now be able to do this in Sibelius. This is a personal preference, of course, and the default is still to show horizontal spreads. But being able to set the page view mode to single pages or spreads vertically is especially great if you're lucky enough to use Sibelius on a computer with a 30‑inch monitor attached. Slurs have also been made more flexible in Sibelius 6 — quite literally. A slur now has six adjustable points, providing finer control over its shape, and the default shape of a slur is usually a noticeably better fit when added to your score. It's also possible to adjust the thickness of slurs individually, and while one shouldn't get too excited about the appearance of a slur, they do look rather more elegant in Sibelius 6. When finely tuning the appearance of objects on a score, such as slurs, it used to be necessary to select an object first to show the handles that could be dragged to make adjustments. But in Sibelius 6, a great new option to View Handles will make such handles visible for all objects on the score, whether they're selected or not. Repeat bar symbols can now be added from the Keypad, which is handy, although what's even better is that Sibelius will now play them back correctly as well. Another useful Keypad addition is the inclusion of a number of avant garde notation techniques, such as stemlets, which help improve the readability of beamed rests, and feathered beams, which indicate whether a group of beamed notes should get faster or slower. Finally, new options have also been added for cautionary accidentals, so that Sibelius now automatically adds a cautionary accidental in the bar after an accidental was used. This is actually quite a big deal, because it instantly creates parts that are easier to read for players, without creating any extra work for the copyist. 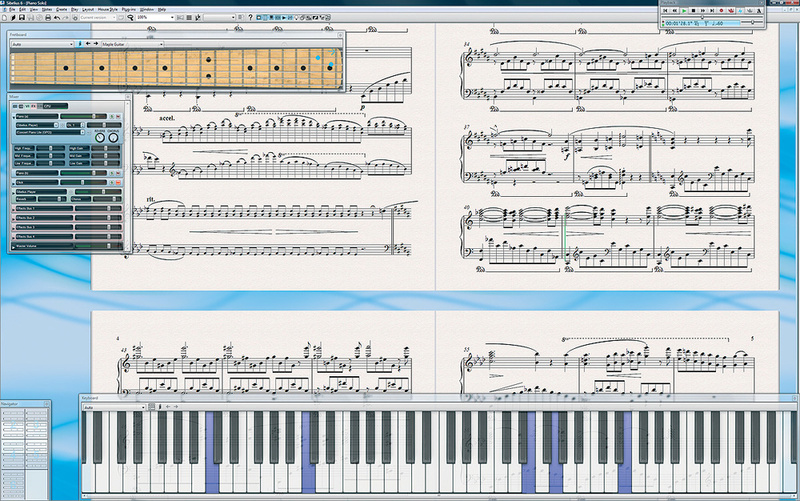 Sibelius 6 is an incredible update to a program that was already pretty incredible. In many ways, it's a more significant update than Sibelius 5, especially with workflow enhancements like Versions, and it also feels a little more refined. With hindsight, Sibelius 5 needed a little time to mature. Sound Sets for MIDI instruments and plug‑ins were initially limited, since they could only be created manually. And it wasn't until the later updates to 5.1 and 5.2, combined with the free Sibelius Sound Set Editor, that everything seemed truly solid once again. Sibelius 6 doesn't have these concerns, and although there were a few issues with it was first released, Sibelius Software were quick to post a 6.01 update to address some of the initial problems. If you're an existing Sibelius user, there's isn't one good reason to upgrade — there's probably about a hundred. And that Sibelius 6 was once considered the junior version makes me marvel in anticipation for what the program's developers have in store for us in Sibelius 7. Live Tempo is a new feature that enables you to conduct your score. Working with Panorama view makes it possible to see the resulting tempo graph. A new Sibelius 6 feature that can be useful when used with the Versioning functionality is the ability to add Comments to a score. These Comments are not to be confused with the comments that can be added when saving a new Version. In fact, one wonders if using different names might have been prudent in this case! Comments in this sense are a kind of virtual Post‑it notes that can be added to your score, providing a space for you to write helpful observations and annotations. These can be useful for reminders, remarks to an orchestrator, or perhaps for a teacher pointing something out to a student. To create a Comment, you simply select an object or a passage in the score and use the Comment command. An empty Comment appears on the score, looking very much like a familiar sticky note, and is by default titled with the name of the person who created the Comment and the date. If you created the Comment with a bar (or range of bars) selected, the Comment will begin with the staff and bar range entered for you, which is a nice touch, although I couldn't help thinking it would be helpful if a line could be drawn from a Comment to the object or passage where it was created. Microsoft Word handles this really well, so you can clearly see what part of the text a Comment pertains to. Comments can be minimised by double‑clicking the title bar, and returned to their original size by double‑clicking again. Alternatively, you can also toggle whether Comments should be hidden completely or not, and you can do the same when printing a score as well. Given how certain elements of Sibelius' interface can be made transparent, it might have been nice if Comments could be made transparent as well, especially since they do have a habit of obscuring the score all too easily. One slight Comment‑related quirk I discovered is that if you move a Comment so the title bar ends up outside the page boundaries, you'll never be able to move that Comment again. This is rather annoying, to say the least. And I couldn't find a workaround, other than to delete the Comment and recreate it. For those users who prefer to enter notes via a piano keyboard, or even a guitar fretboard, the new Keyboard and Fretboard windows will be particularly welcome. Both windows are resizable and allow you to enter notes by clicking the on‑screen display, just as you might enter notes via an external MIDI device. There's even a handy Chord Mode, allowing chords to be entered one note at a time without the input caret moving onto the next beat, which is the normal behaviour. These windows are going to be great once laptops with multi‑touch screens become commonplace. Rather than being simply static input windows, both work interactively with the score. Notes for the currently selected beat are displayed, allowing you to change the pitch. When a score is played back, both windows indicate note pitches as they're performed. The display of pitches in the Keyboard and Fretboard windows is very clear, using the appropriate voice colour for a given note. The only slight quirk with the Keyboard window is that there seems to be no visual cue to indicate which note is middle 'C', and when the window is large enough that a scroll bar appears, it becomes pretty much impossible to find. As far as I could tell, the only workaround was to select middle 'C' on the score, so that it becomes illuminated in the Keyboard window. 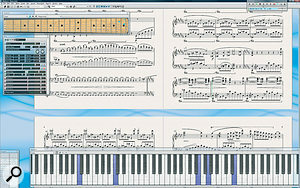 Although Sibelius has always allowed you to enter notes via the computer's keyboard, the Keyboard window offers an alternative approach. Normally, you would enter notes by typing the appropriate note letter on the keyboard: type the letter 'A' and you'll get an 'A'‑pitched note on the score. But when the Keyboard window is open and the QWERTY Input button is enabled, Sibelius will turn your computer keyboard into a one‑octave piano keyboard, with the pitches arranged as they would be on a piano. When QWERTY Input is enabled, pitches that fall outside of the current octave range are greyed out. However, it would be so helpful if the 'C' notes were numbered so that you knew in which octave you were focused. And for that matter, wouldn't it be nice if the pitches could be labelled with the key that triggers them when QWERTY mode is enabled? This way, you wouldn't need to look up the shortcuts in the manual. As I'm not a guitarist, I confess that I'm not the best person to judge how well the Fretboard window is implemented. A nice touch is that there's a choice of three fretboard styles for a conventional six‑string guitar ‑— Maple, Rosewood, and Acoustic — and an additional three styles for a bass guitar as well, including a five‑string style. One point that's not immediately clear is that you can only choose the bass styles if there's a suitable bass staff in your score. Otherwise, when the option is chosen, nothing will happen, which is a little inelegant. On a large score, the Keyboard and Fretboard windows could easily become confusing during playback if all pitches from all instruments were displayed. So both windows offer a pop‑up menu on their respective toolbars, enabling you to set which staff in the score will be followed. This is set to Auto by default, which does actually follow all the staves, except those for non‑pitched percussion instruments. However, if you had only certain staves selected before you pressed play, Auto will mean that only these staves will be followed. In addition to all the new features in Sibelius 6, there are also a number of features that have been removed. Of particular note is the ability to import scores from the Acorn versions of Sibelius, or from Finale or SCORE (an older engraving application used by some publishers). For Acorn users, Sibelius suggest using an earlier Windows or Mac version of the program, resaving the file, and loading it into Sibelius 6. Obviously, this isn't a helpful suggestion if Sibelius 6 is your first Windows or Mac version. But, in fairness, most Acorn users have probably already adopted a more recent version of Sibelius before this latest release. For importing Finale files, Sibelius suggest using the MusicXML format to import data from Finale into Sibelius, and vice versa. Sibelius' MusicXML support has been steadily improving, and it makes more sense for Sibelius to concentrate development efforts here instead of trying to reverse‑engineer Finale files. For some behind‑the‑scenes insight into the development of Sibelius 6, Sibelius' Senior Product Manager Daniel Spreadbury tells the story behind Sibelius 6 on his blog at www.sibeliusblog.com. If you want to learn more about the new engraving features, one of Sibelius' developers, James Larcombe, has written a detailed post on his blog at http://jlarcombe.blogspot.com. Versions offers a convenient way to keep track of edits made to a score. Thanks to Magnetic Layout, it's quicker and easier than ever before to keep your scores looking neat and tidy. The new built‑in software instruments make playing back scores easier when compared to using Kontakt Player in previous versions. The multitude of smaller changes and improvements would make the upgrade worthwhile even without the headlines. Although there are a few quirks, there's nothing so terrible that it would prevent me from recommending Sibelius 6 to new and existing users alike. 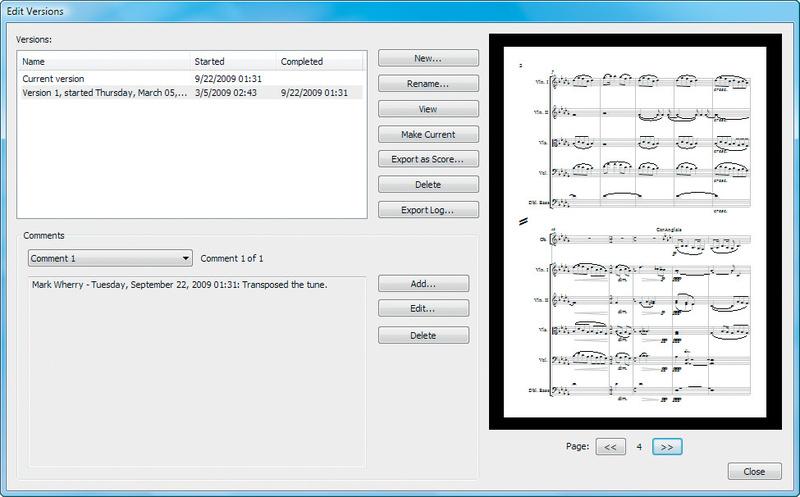 Sibelius 6 once again raises the bar when it comes to notation software. Offering significant workflow enhancements, while refining other areas of the application, this version should please both new and existing users. £582.34; upgrades from version 5 £159.85. Prices include VAT. Sibelius Software +44 (0)20 7561 7999. $599; upgrade from version 5 $169. Sibelius Software +1 (888) 474 2354. PC with dual 2.66GHz Xeon 5355 CPUs, 16GB memory, Nvidia Quadro FX 560 graphics and RME HDSP 9652 audio cards, running Windows Vista Ultimate 64‑bit with SP1.